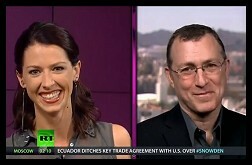 " Articles in Category: Abby Martin	"
I was on Abby Martin's Breaking the Set program on RT America this evening. The video is posted below. 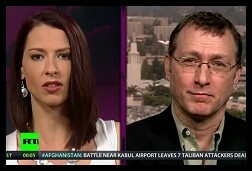 We discussed the NSA leaks and everything related to it, including, briefly, my own disturbing experience --- which I have in common with Glenn Greenwald --- when we were both targeted by a cyber-scheme devised by government defense contractors set to turn tools developed for the "War on Terror" against us, at the behest of major corporate interests. In the wake of a violent, night-time confrontation with Occupy Oakland demonstrators last week by the Oakland Police Department (OPD) and some 15 other law enforcement agencies, questions have arisen about the legality of the tactics used by the agency during mass arrests which led to serious injuries, including the fractured skull of a two-tour Iraq vet. Moreover, evidence in several of the videos suggests that the multi-agency task force may have violated both CA Penal Code Section 407 and an OPD Training Bulletin [PDF] that had been adopted pursuant to a federal consent decree signed by the Oakland PD after another confrontation with protesters some years ago.